Summer officially starts this week and the weather in Washington, D.C., is getting warmer. While water features on the U.S. Capitol campus look cool and refreshing, they aren't designed for humans to play in. These small areas of urban "blue space" may provide other benefits though, including mental tranquility and increased creativity. Below is a collection of seven water features that inspire. 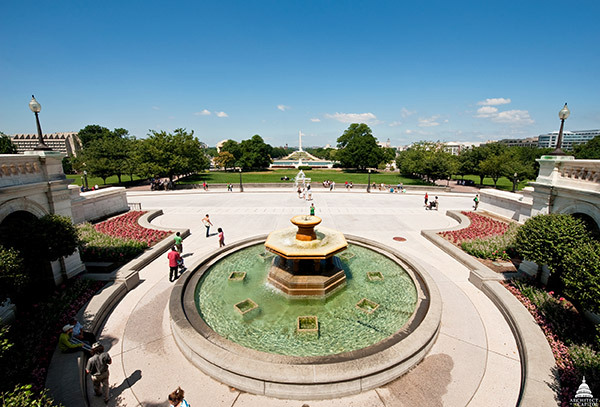 Near the central entrance of the U.S. Capitol and the U.S. Capitol Visitor Center are two large fountains designed by Frederick Law Olmsted that often feature floral displays. 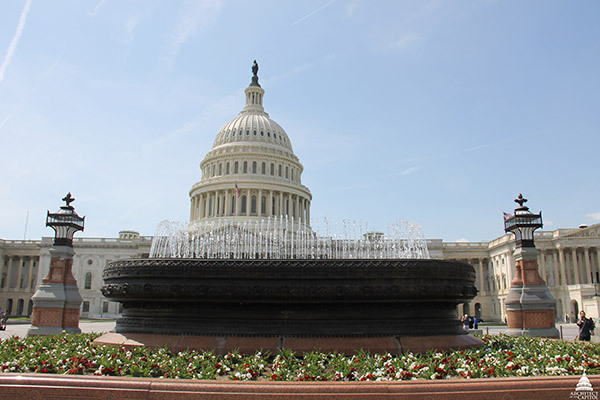 The octagonal fountain on the West Front of the U.S. Capitol has a circular basin with eight planters just beneath the water's surface. During preparations for Presidential Inaugurations, this fountain is covered by the special platform built for the occasion. 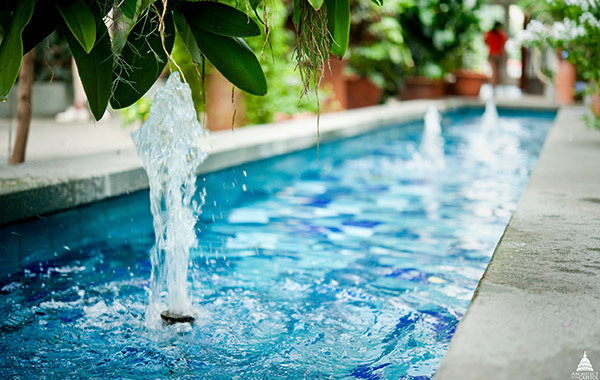 Take a break from the heat and go inside the U.S. Botanic Garden's (USBG) Conservatory, where two identical pools flank the main entryway. 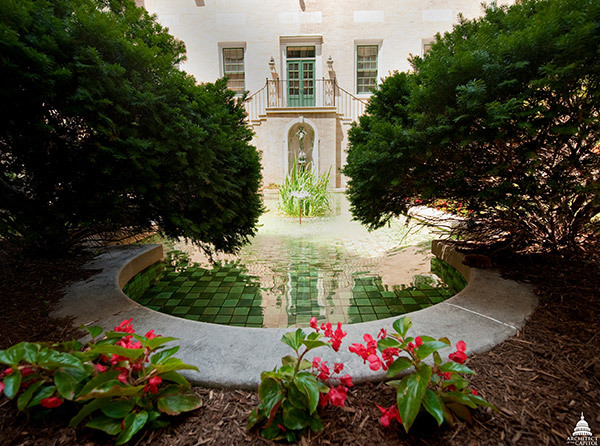 Another water feature found at the USBG Conservatory is in the Mediterranean Room. 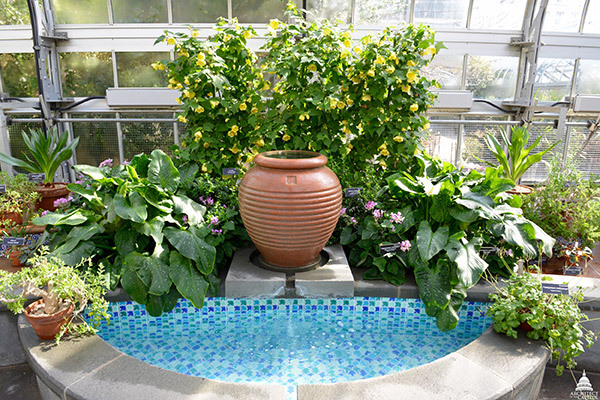 This fountain features a glazed clay vessel that streams water into a larger basin below. 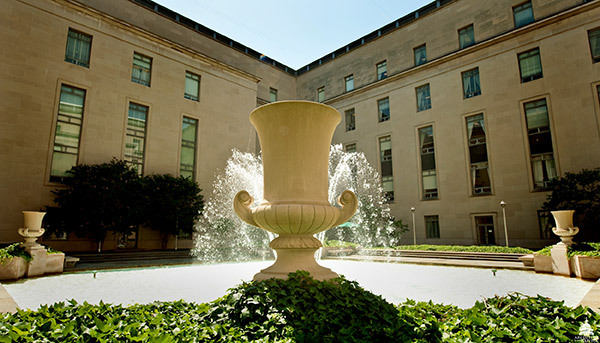 The Rayburn House Office Building, along with most of the other congressional buildings on campus, has a fountain in its central courtyard. Thirteen jets create the main display in its basin. Located in the Library of Congress Thomas Jefferson Building's northwest interior courtyard, a small bronze statue of the Greek god serves as a fountain just outside the entrance to Whittall Pavilion. This water feature, built into the east side of the Supreme Court Building on 2nd Street, discharges water from three sculpted marble lion heads into a long thin basin. 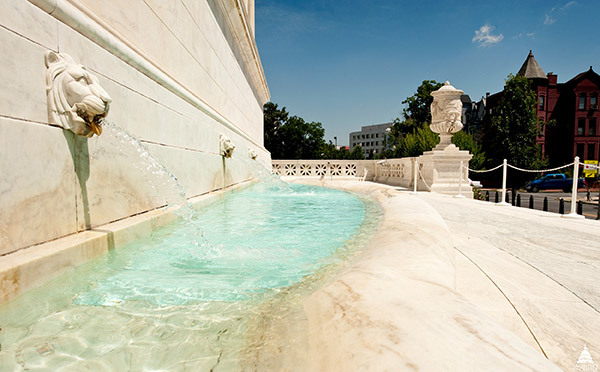 Read about previous U.S. Capitol campus water features we've highlighted on the AOC blog. awesome... beautiful. reminding me to get out for lunch and enjoy the summer before its gone. thanks!